We were recently asked by a leading Contract Packing service provider to look into providing an automated solution to assist with the packing, strapping and palletising of Point Of Sale ( POS ) displays for products going into the retail industry. As with many businesses within the retail industry, profit margins are very tight and contracts can be fairly short term, so a cost effective solution was needed in order to achieve the required ROI. 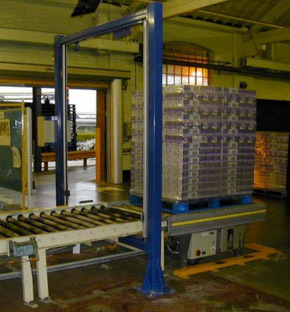 The resulting system consisted of a network of powered and non-powered conveyors to assist with moving displays down the packing line. 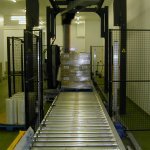 Once the displays had been manually packed, they made their way into an automated strapping cell where they were strapped and fed to the end of the line in readiness for palletising. This particular system is able to handle POS’ of various shapes and sizes, up to a maximum weight of 94kg per unit. Feedback received from the client is that throughput has increased by a massive 40% and that the structured nature of the process has minimised the requirement for FLT and PPT intervention. This in turn has improved working conditions from a Health & Safety point of view and allowed them to take on more work. So much so that a second and third system is in the pipeline for installation in 2018. 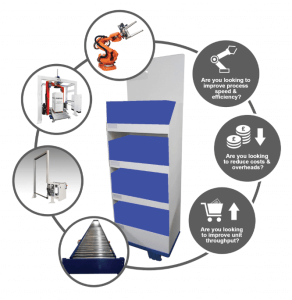 Andrews Automation Ltd are specialists in integrated materials handling automation solutions. Our solutions are designed, mechanically and electrically built and tested in-house. We also install and look after all after sales aspects of our projects, so whether it’s something standard you’re after, or something that little bit more bespoke, Andrews Automation Ltd are able to help.